18777 Sébastien Bouchard has taken the top command position at Royal Military College of Canada during a 55 minute ceremony Friday morning (14 Jul) in historic Currie Hall. The presiding officer was 16204 Rear-Admiral Luc Cassivi. 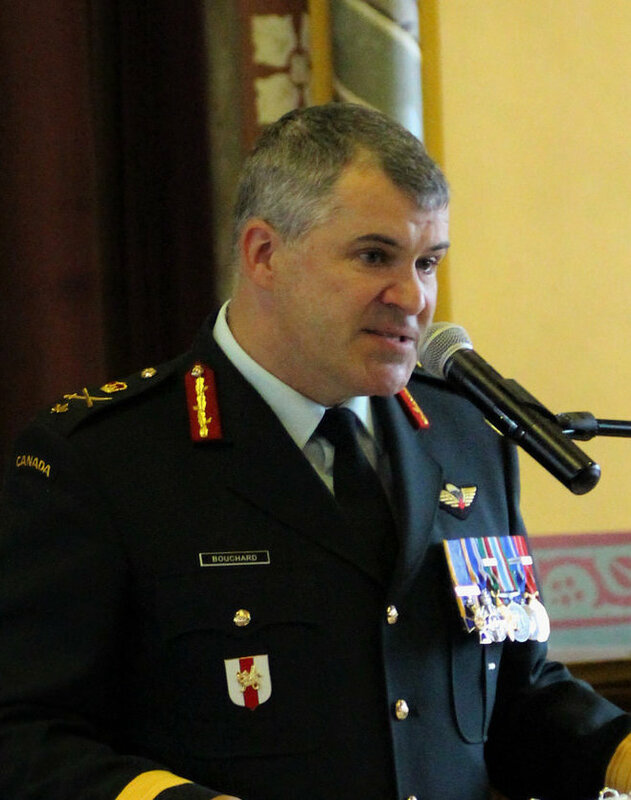 Bouchard officially became the 47th commandant replacing 16855 BGen Sean Friday, who is moving to NDHQ Ottawa and will fill the position of Chief of Staff for Vice Chief Defence Staff. 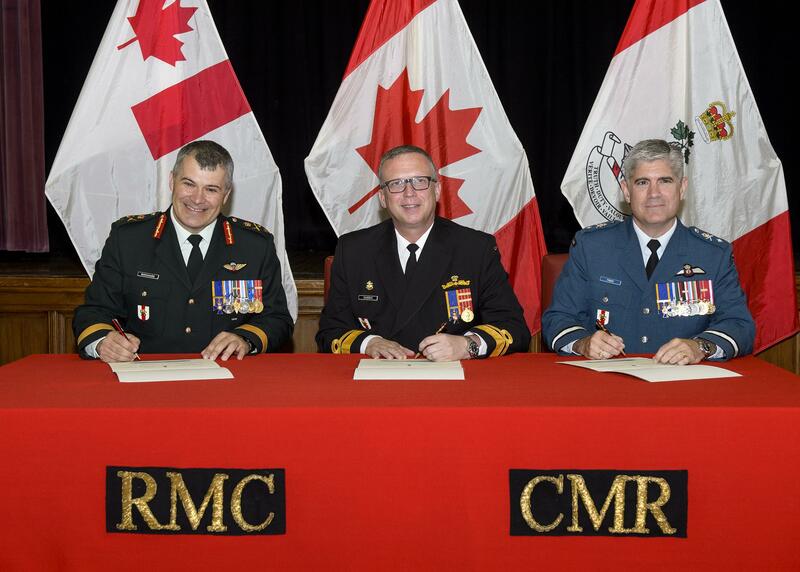 Bouchard entered the military colleges system at CMR in 1988 and graduated from RMCC in 1993 with a degree in mechanical engineering and commissioned as a electrical and mechanical engineering officer (EME). The Lac St-Jean native has an impressive résumé highlighted with a number of international and domestic leadership accomplishments. The ‘family’ has quite the military college connection. His wife is 19619 Karine Chayer and is a 1995 CMR grad. Two sons are currently in the system – one entering II year at RMC and the other just starting at RMC Saint-Jean. Two daughters were in attendance and watched proudly as their dad signed on as the new commandant. Threatening weather dictated that the Change of Command ceremony was moved inside. Weather aside the event was well attended with Currie Hall being full on the main floor and the balcony. Over the 55 minutes there were three main speeches – outgoing commandant; presiding officer and the incoming commandant. All three pretty well touched all the bases on what one has come to expect in this type of handover (See the Whig Standard article below). If it be your tradition I would invite you to join me in asking God’s blessings and protection for those in uniform and of course on the outgoing and incoming Commandants of RMCC. If you have not already done so I would invite you to remove headdress. If you are not a person of prayer then kindly take this time to reflect on your own wishes and hopes for our CAF personnel and these two men. Good and gracious God, traditionally summer is a time to “down tools”, to rest, and be re-energized. Grant rest, we pray, to all of our CAF personnel, especially our staff and students, and their families. Pour ceux et celles qui ne peuvent pas profiter d’une pause estivale : pour nos troupes déployés outre-mer ou qui combattent des feux de forêt dans l’Ouest du Canada ; pour le personnel des Forces aériennes qui les transportent (parmi d’autres tâches) ; et pour les marins dans nos navires déployés. Protèges-les et aides, nous te prions, les membres de familles de tous les membres de nos Forces Armées. 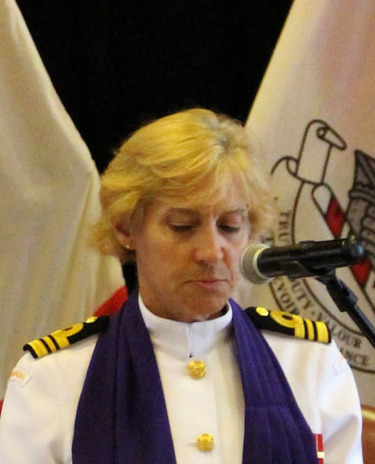 We ask your blessings on the outgoing Commandant and his spouse, Anne-Lucie. General Friday led this College during an extremely difficult period rife with challenges: BOIs a major SSAV; the deaths of a few students; and one staff member. The task of leadership was not an easy one. May God bless you both, and your family, as you turn your attention to new challenges in the Nation’s Capital. Prions aussi pour Brigadier Général Bouchard et sa famille. God grant General Bouchard a sense of humour, a ton of energy, a sound life-work balance, compassion, wisdom, and courage as he assumes the mantel of power over hundreds of staff members and students here at RMCC. May he, with the help of his leadership teams, create an environment where morale is high, people desire to come to work, and students crave the next day of learning and growth. May the example that he gives by all of the choices he makes be a positive influence on every member of the Royal Military College of Canada. Amen. Bravo “Bouch”, tu es le bon gars pour la tâche!! !